The Three Tees is a family run hotel, offering bed and breakfast accommodation near Lusty Glaze Beach in Newquay, Cornwall. The Three Tees is a family-run nine bedroom licensed hotel with ample off-street parking, situated in the quiet Lusty Glaze area of Newquay. 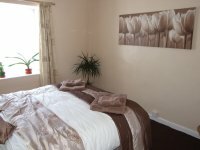 We are a short walk to the beach, and 10/15 mins walk to the town centre. Along with our AA Gold Stars award and top-level Food Hygiene Rating, we've recently been awarded a Certificate of Excellence by TripAdvisor.